John Deere 425D, 430D, 435D, and 440D Drapers are capable of windrowing out of the center, right, or left ends of the draper with effortless change using the hydraulic deck-shift option. 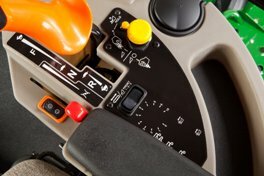 The deck-shift option gives larger windrows to match up with larger combines and self-propelled forage harvesters (SPFH). 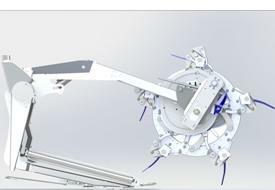 This provides the option for matching narrower-width drapers with higher-capacity harvesting. 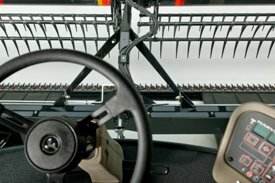 The deck shift also gives the capability of putting a higher-density windrow in front of a combine or SPFH when the crop yields are low during drought years. Hydraulic deck shift allows discharging two windrows side by side with the heads of the crop aligned. 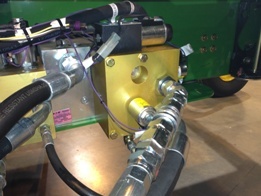 This gives uniform feeding into the combine or forage harvester for a smooth and efficient harvest. 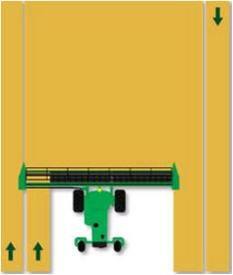 Hydraulic deck shift gives the ability to change the center belt opening quickly and easily for different crop types and density. This is done by moving the chain stop. See operator’s manual for more information. 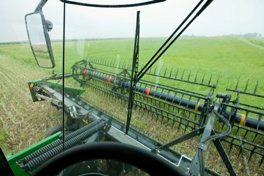 Hydraulic deck shift gives the ability to discharge the crop to the outside on the headland to prevent running over the windrow while cutting the rest of the field. The hydraulic deck shift option gives the capability to shift decks from left-to-right or right-to-left discharge with the press of a button. On the W150, the control also adjusts the fine-float adjust to keep the platform balanced. An optional double draper drive bundle is available and recommended when using deck shift and harvesting silage or wet, heavy crops. 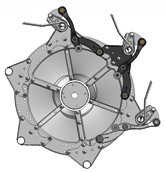 Note the double draper drive option is not compatible with the 425D Platform. 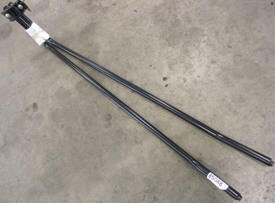 There are optional left- and right-end swath deflector rods. 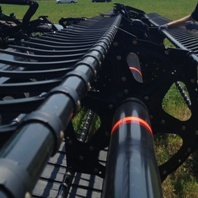 When using the deck shift, these rods form a space between the windrow and uncut crop to have adequate clearance for the crop divider on the next pass. The 430D, 435D, and 440D Draper models can be equipped with an integral, slow-speed transport system. One person can convert the draper from field to transport in minutes without the use of tools. 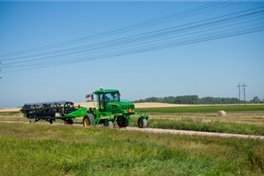 The W150 Self-Propelled Windrower is the only model approved to tow a 400D Draper Platform. 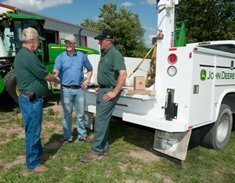 Transport is also recommended behind a tractor with a seven-pin electrical lighting outlet. 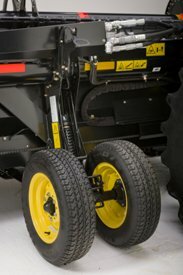 Dual front-dolly wheel tires and two gauge-wheel tires carry the complete weight of the draper when in transport. Move right gauge wheels from field to transport position. Move left gauge wheels from field to transport position. 400D Series Draper Platforms offer optional 15-in. dual-gauge wheels with spring suspension. This combined with the windrower float system provides flotation and excellent ground following in all conditions. 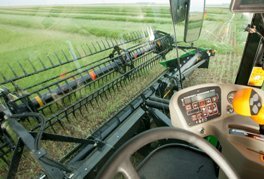 The operator can fine adjust the float on the go from the cab, allowing high-speed harvesting and stable flotation with the assistance of the adjustable spring-loaded gauge wheels. The gauge wheels are also available as part of the integrated slow-speed transport system option. The 400D Draper Platform features a cam design reel that feeds well in all crop conditions. 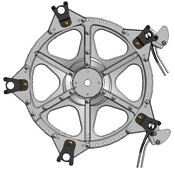 The cam pickup reel features a 165-cm (65-in.) effective diameter and utilizes heavy-duty plastic or steel fingers and heavy tine tubes. The reel features a cam to control tooth position. The smooth cam action and heavy tine tube design allows the reel to operate at higher speeds with a smoother, quieter operation. This gives better feeding with less wear on the reel drive components and, more importantly, less shatter of the crop harvested. The reel is designed and assembled to have an hourglass shape. This allows the ends to be positioned closer to the cutterbar for positive feeding while keeping the fingers at the center of the reel span from coming into contact with the cutterbar. Feeding is most important at the ends. 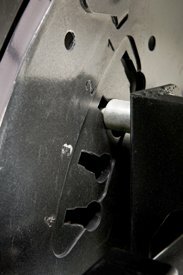 Other reel designs do not have the capability of such tight adjustment. The hourglass shape is designed with an adjustable bolt position on the reel tine tube brackets to the discs. Optional end fingers improve feeding aggressiveness in difficult feeding and cutting conditions with down and tangled crop. 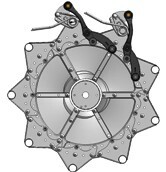 The reel is available in five-, six-, or nine-bat configurations. 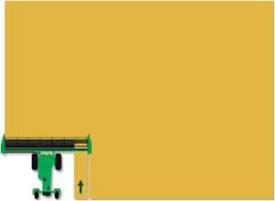 The nine-bat configuration gives more interaction for more positive and smooth crop flow in heavy down crop conditions. Additional bats can be field installed to convert from six bats to nine bats. Additional bat configurations are recommended for heavy crop conditions such as silage and grass seed crops. 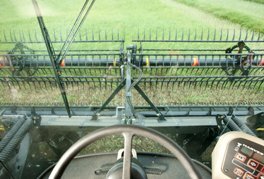 The cam position and reel position are adjustable, enabling the machine settings to be matched with the crop conditions for a trouble-free harvest. The finger release position is easily adjustable to one of four cam positions. The reel is hydraulically positioned up, down, and fore-aft to allow perfect positioning for gentle yet positive feeding action. Plastic fingers come standard from the factory on all platforms. Steel finger options are available through Parts and are recommended for heavy forage crop conditions due to the longer life. The plastic fingers are recommended for all crop conditions. The plastic fingers weigh less and work well in all crops. The plastic fingers are easier to replace individually without having to disassemble the other fingers on the reel tube section. All 11-m (35-ft) split-reel platforms (North America and export) and the 12-m (40-ft) split reel platforms (North America only) come standard with tine tube stiffener kits to handle heavy crop conditions and improve the life of the platform. The reel is available in a single span only from 4.1-m (15-ft), 6.1-m (20-ft), and 7.6-m (25-ft) sizes. Single-span or split-reel spans are available in 9.1-m (30-ft) to 11-m (35-ft) sizes. Split reel only is available in 12 m (40 ft) size. There are optional end feed fingers (three per end are available as field installed) for tough feeding conditions. The single-span reel offers less weight and better center visibility. 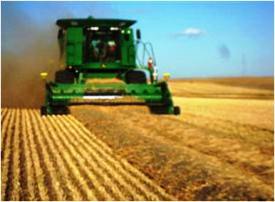 It is a good option for producers who harvest canola and small grains for oil and seed. 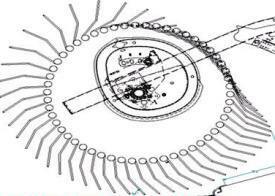 The split-reel span gives better feeding in adverse crop conditions such as heavy, wet, and down crop. The split span gives better control of the reel height on wider platforms for more consistent feeding. 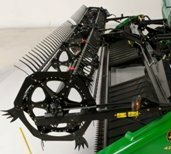 The unique C-shape cutterbar allows for easy crop flow onto the draper while providing a superior draper-to-cutterbar seal. The seal between the top of the C-shape cutterbar and the draper belt is important to limit the amount of material that gets under the belts. The open design at the bottom of the C-shape cutterbar allows any material that does get past the seal to fall back out. 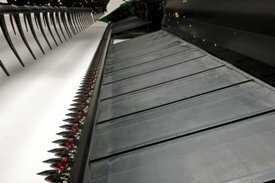 This reduces the amount of material that gets inside the draper belts. This cutterbar shape promotes smooth crop flow across the cutterbar, minimizing hesitation and crop loss in shatter-prone crops. The cutterbar and frame designs give excellent visibility across the full range of tilt. The cutterbar and belt can be easily seen from the cab even with the optional top-crop conveying auger installed. The cutterbar can be tilted from the cab mechanically or hydraulically depending on the windrower option chosen. 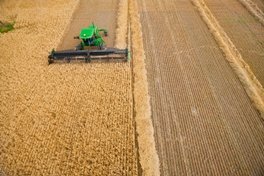 This allows operators to optimize the cutterbar angle for varying crop and field conditions, thus extending the harvest day and providing the best possible cut height and crop flow. Sales, parts, and service support from your local John Deere dealer offer overnight parts delivery and a well-trained support staff. An optional reverser is available for the W150 only. It is easily activated from the operator's station to clear the platform of plugs that may occur. 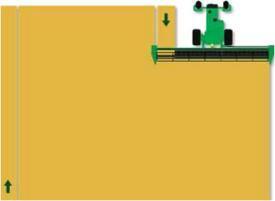 On the 400D Platforms, the reverser slowly reverses the knife drive and optional hay conditioner if equipped to clear plugs. 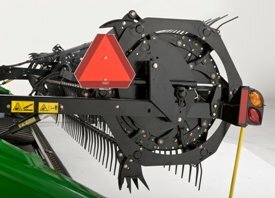 The reverser is highly recommended when using the optional hay conditioner with the 400D Draper Platform. On the 100A Auger Platform the reverser slowly reverses the conditioning rolls, auger, and reel. This makes a difficult job easier, so the operator can be more productive. Operators can run the machines nearer to their maximum capacity and it will take less time to unplug, adding to the machine productivity. The reverser consists of a valve block and valves shown in photo above. It is the gold colored valve block to the right of the photo. It is shown plumbed for a 100A Auger Platform.